Interested in lake design and consulting services? We can help! Lake, pond and property management consulting. Find out what services and products we offer our clients. Own treasured land with water on it? You’ve come to the right place! Ask most fisheries biologists about lake management and they start talking about fish, habitat, food chains and all that biologically-important stuff. Have an audience with Bob Lusk and what he wants to know first…is you! “I try to figure out the ‘it’ of your mission,” is Lusk’s famous quip. But, it’s true. 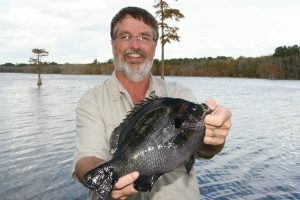 What makes Bob Lusk the ‘go to’ consultant to improve your land and water is that he “get’s it”. Bob has worked with plenty of high-end clients. He knows what it takes to help you take a premier property and guide you to making it a legacy…your legacy. He is surrounded by a team of cracker-jack biologists, businessmen, entrepreneurs and knower’s-of- things-large-and-small. His network of professionals in the field of land and water management, outdoor communications and craftsmen has no comparison. Want to grow giant fish in a pristine environment? Bob Lusk is the man. Want to improve your lake and make it more aesthetically appealing? Lusk is the one to call. Looking for wildlife management? Is your mission, in part, to improve the value of your land without breaking the bank? All these things and much, much more are available when you work with Bob Lusk. He’ll help you design your boathouse, shop for good fishing tackle, teach guides how to cater to your discerning friends and colleagues. Bob Lusk is a gifted fisheries biologist, writer, photographer, dad, husband and grandfather…but, most of all, he knows how to get results. Call or email today!